HTTP requests are very crucial and much needed in any modern front-end application and Angular 2 does this job very effortlessly. Angular 2 comes with its own HTTP library. 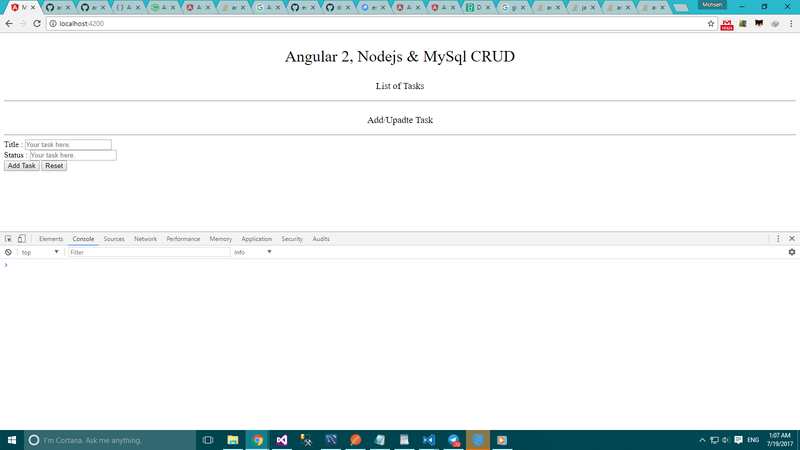 Here, we will create Angular 2 CRUD application using Nodejs. We will use Nodejs to create our REST API and we will use Angular 2’s HTTP library to make HTTP requests with the help of Observables. In this article, We will make a list of user’s and we will create functionality to Update/ Remove the user from the list of users. For this article, I am not sharing the code for REST API, You will find REST API code into the .zip file When you will download the code. The final outcome of this article shown below in Image. The first argument is a URL and the second argument is optional which can be anything. Can perform any type of request. The first argument is a URL and the second argument is optional which can be anything . Performs a request with get HTTP method. Performs a request with post HTTP method. Performs a request with put HTTP method. Performs a request with delete HTTP method. Performs a request with patch HTTP method. Performs a request with head HTTP method. => Till now we understood Angular’s HTTP library and how many methods it has and Now let’s create angular service for our application. 1. HttpClientModule => If your application uses HTTP library, then you will have import this module. 2. FormSupportingModule => As the name of the module reads, you will add the all the form related module here. 3. ServicesModule => In this module, you will register the all the here. => In the last section, we understood that we will create two more modules i.e.FormSupportingModule, andServicesModule. => We will create a module named as servicesand all of our services will go under/services folder. The Services Module will add those services to our application. => So next time when you create any new service you don’t have to touch the app.moudle.ts file, Just add into service.module.ts file and you are done. => Here we will have two service forms.service.ts and http.service.ts. Each service has it’s own agenda, here FormService will help you when you create the Form using which you willadd/updateuser details. When you create an Angular application on a big scale, it recommended to keep your application modular. So I have kept my habit to keep all of my Angular application modular. You can write above code in Component class without any doubt, but for the sake of modularity, I have kept this code in separate file. We have imported all the interfaces from the folder called /interfaces. Just to save the length of this article, we won’t talk much about it. You will get all the interfaces when you download the code. To access the HTTP library, you will have to create an instance of it and then you can call an appropriate method on that created instance. As you can see here we have total 4 methods, every method name is self-explanatory. So just by looking at this code, you will get the purpose of each method. Here each method returns an observable of some specific interface, These Observables will be consumed in your component class. => In this application, we will have total three form fields i.e. username, email, and country. We have already created Service which holds the instance of the Form. => So we will useFormServiceservice and complete our form by which we can add the new user details in our database. Open the app.component.html file and add the below markup. => The below code is very straightforward to understand, we have created a very basic Angular form. Also, we have added error message as well. First, we have imported theFormService andHttpService services respectively then we have imported all the interfaces. usersList: This array of objects having User as an interface, each object would represent a single user detail. userForm: This property will hold the instance of a Form. In constructor() method, you will use FormService to get the instance of a Form. Leave the ngOnInit() we will use it later. On the click of submit() method, you will calladdNewUser() method. TheaddNewUser() method will basically consume the HttpService. TheaddUser() method is defined inside HttpService, in which you will pass the value of the form. After getting a response from the server, you will push the details inside the userList array. => Now that you have added a new user in your database, let’s fetch all those users and display them. The first step would be to write a markup in order to display the list of users. =>In the below MarkUp, we have used *ngFor to iterate the users from the userList property, that’s all happening there. => In the last section, we left ngOnInit() method blank. Here we will use it and we will consume the HttpService as usual to fetch the users stored in the database. In ngOnInit() method, we have calledgetUsers() method of AppComponent class. ThegetUsers() method will consume the HttpService and return all the users stored in the database. => Here, we will add a button (let’s say X) to each row of the list to delete a particular user from the list. Whenever the user clicks on delete button we will make DELETE HTTP request to the server. => Behind the scene, our API will remove that user from the database. Also, we will remove that user from theuserListproperty of AppComponentclass. When users click onXbutton we will calldeleteUser()method which is defined insideAppComponentclass. In thedeleteUser()method we will pass theidof the user and based on thisiduser will be deleted from the list and from the databse as well. The first thing we will do is, consume thedeleteUser() method from HttpService. This will delete call the DELETE HTTP request, which will delete the user from the database. Once response received from the server, we will remove the user from the userList property of the AppComponent class. => Building this part involves the two important steps, First selecting and highlighting user from the rendered List. Then calling a function to update the select, which eventually make the UPDATE HTTP request. => I have divided this part into two small parts, In the first part we will select and highlight the clicked user from the list of the user. In the second part, we will make an UPDATE HTTP request. We will highlight the selected user from the list. We will update Form fields based on user selected from the list. Also, we will hide theAdd User button and we will show the Update Button. In the above markup, the two highlighted lines are doing trick for us. When we will click the list, the selectedUser() method will be triggred and this method will update the Form fields. isSelected() return boolean and based on that class .active will be applied to the li. => Now let’s write code inside theAppComponentclass and the complete these features, Open theapp.component.tsfile and below property into it. The below property will hold the id of selected user from the list. => Now based on the above property we will show and hide the Update and Add User Button. So to do that, replace the Markup for the submit button by below markup. => In the below markup, the Buttons will hide/show based onselectedUserId property. TheselectedUser() method will update selectedUserId property and it will update values of form controls as well. isSelected() method will check if the selected user’s id equals to theselectedUserId property and based on this it returns a boolean value. => Now the last piece of the puzzle is making HTTP calls to update the record in the database. When you will select any user from the list the update button will show up. The first thing would be to call updateUser() oraddNewUser() based onselectedUserId property. Then inside theupdateUser() method two things are happening first is we are making an HTTP call to update the record of user and second we will update the userList as well for that particular id. 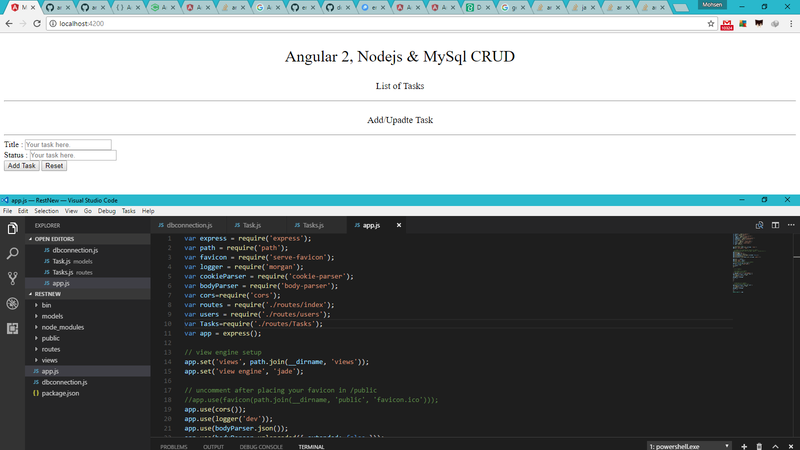 In this article we understood, Angular 2 HTTP library and it’s methods and we created a basic CRUD application using Angular 2. If you have any questions or doubts let me know in below comment box, So that’s the end of this long article. Also, If you find this article useful the do share with others. Hey thanks for stopping by, I’ll check and Update the file. I see you are using Bootstrap classes but I do not see where you are importing Bootstrap into the code. I checked the download and its not there either. Where would you place a cdn call to get Bootstrap in a ng cli app? I learned a lot from this tutorial, thank you. Okay just checked source code,I think I forgot to include the index.html file. You place a cdn call to get Bootstrap in a index.html, which is located inside the /src folder. Really nice tutorial. I have typed all code and trying to run since today morning, but “node server.js” command is not running in “NodeJs REST api” folder. It is giving following error. Can you help? The reason for getting this error MongoError: connect ECONNREFUSED 127.0.0.1:27017, is mongod is not running while you start the nodejs server.Make sure mongod is running while you start the Nodejs server. if mongod is running then check is it running on port 27017 ? Thanks, that was done at the same time. 🙂 (Y) ! Hi . I get An error . Cannot GET / why ? This is my api project. 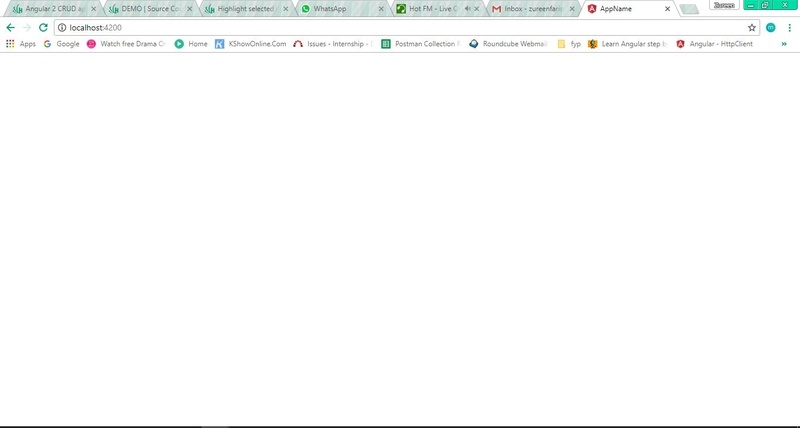 Everything works well and I get api, but I cant show up at Ngfor . Why ? This is my api project . In those screenshot, I think you have no errors. Why don’t you check whether you are getting a the response from the server by click on on network tab in the inspector of the chrome (screenshot 1). If you are receiving a json response from the server then problem lies in Angular app if not then problem is in your server logic. https://uploads.disquscdn.com/images/1fac8687f7689afd203bd990260719c54254b5624a5172eee5b37fb1fbd236b4.jpg i already follow all your steps and i dont have any error but why it doesnt want to appear anything? Strange then, You are saying ‘I don’t have any error’ , i assume You have checked your console. Please check the CMD window also. If there also you have no errors, please let me know we will try to solve it. Sorry, as of now I haven’t created git repo for this article. The download link is not working ? or Code provided in that is not working ? Hi there, I know it’s too late but I have updated the code and Blog Post. Also, I have uploaded this Project on Github as well. its really useful and nice article . 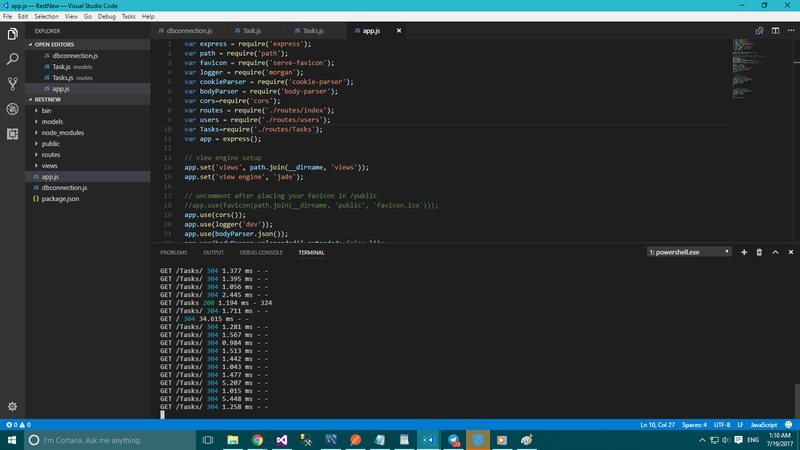 using this step , i have created app by using node js api in sql server as backend. its working properly but while i m inserting or updating or deleting , list is not updating at a time, when i refresh the page it will refreshed the grid. please provide suggestion or code to update list after any DML operation. thanks in advance!!! After sending HTTP request to store the data, wait for the request to come back. And based on the HTTP response, you can push the records into usersList Array. Make sure you send proper HTTP response such from Nodejs server. Let me know If am not clear, Also I am gonna update this article very to stay tuned. Hi there, I have updated this Blog Post, download new source code or Just clone it from Github.